Matthew Apgar - mapgar@shawmedia.com The Dean Street School is photographed Tuesday, Feb. 27, 2018 in Woodstock. 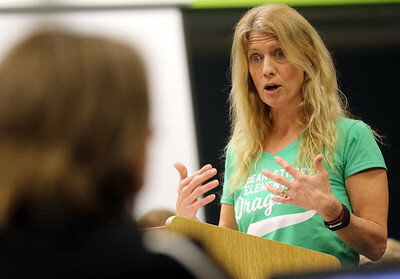 The school is the subject of a board of education meeting Tuesday night which will discuss its future. 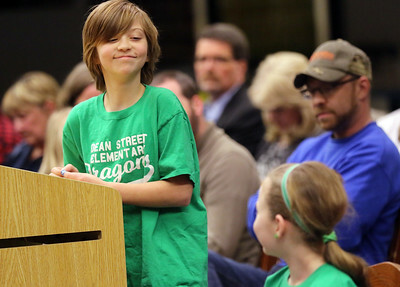 Matthew Apgar - mapgar@shawmedia.com Attendees applaud as Dean Street School fifth grade student Annalise Wickersheim (left), 11, smiles at her best friend, Madeline Scaman (right), 10, after Scaman gave public comment in favor of keeping the school open despite recent discussions considering the school's closure during a District 200 Board of Education meeting at Woodstock High School on Tuesday, Feb. 27, 2018 in Woodstock. After hearing comments from members of the public, the board agreed to keep Dean Street School open. 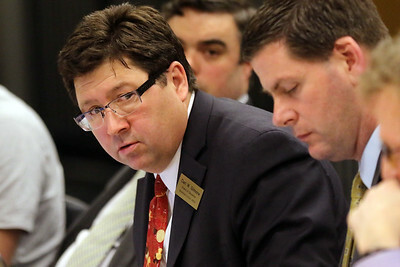 Matthew Apgar - mapgar@shawmedia.com Carl Gilmore addresses board members during a District 200 Board of Education meeting at Woodstock High School on Tuesday, Feb. 27, 2018 in Woodstock. After hearing comments from members of the public, the board agreed to keep Dean Street School open. 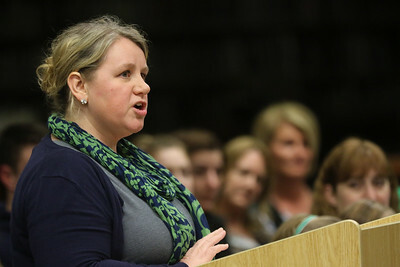 Matthew Apgar - mapgar@shawmedia.com Dean Street PTO member Karen Hendrickson addresses board members in favor of keeping the school open despite recent discussions considering the school's closure during a District 200 Board of Education meeting at Woodstock High School on Tuesday, Feb. 27, 2018 in Woodstock. After hearing comments from members of the public, the board agreed to keep Dean Street School open. 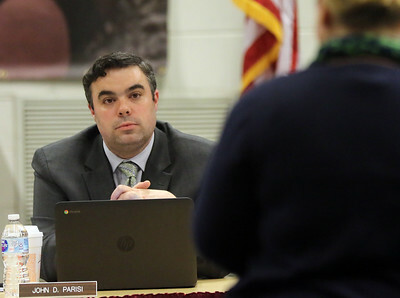 Matthew Apgar - mapgar@shawmedia.com Board member John Parisi listens as Dean Street music teacher Carolyn Sharpe offers public comment in favor of keeping Dean Street School open during a District 200 Board of Education meeting at Woodstock High School on Tuesday, Feb. 27, 2018 in Woodstock. After hearing comments from members of the public, the board agreed to keep Dean Street School open. 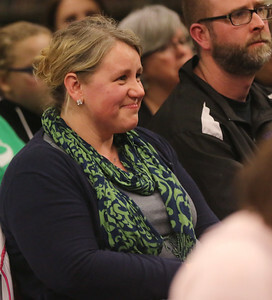 Matthew Apgar - mapgar@shawmedia.com Dean Street School music teacher Carolyn Sharpe smiles as she holds back tears after hearing District 200 Board of Education members announce that they will not close the school during a board of education meeting at Woodstock High School on Tuesday, Feb. 27, 2018 in Woodstock. After hearing comments from members of the public, the board agreed to keep Dean Street School open. 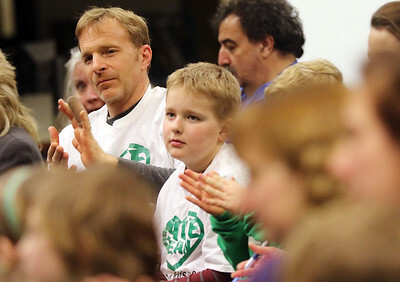 Matthew Apgar - mapgar@shawmedia.com Todd Hendrickson and son Cody, 10, applaud while wearing white shirts that read "Save Dean" during a District 200 Board of Education meeting at Woodstock High School on Tuesday, Feb. 27, 2018 in Woodstock. After hearing comments from members of the public, the board agreed to keep Dean Street School open. Matthew Apgar - mapgar@shawmedia.com Dean Street fifth grade student Madeline Scaman, 10, smiles at her best friend and classmate, Annalise Wickersheim, 11, after giving public comment in favor of keeping the school open despite recent discussions considering the school's closure during a District 200 Board of Education meeting at Woodstock High School on Tuesday, Feb. 27, 2018 in Woodstock. After hearing comments from members of the public, the board agreed to keep Dean Street School open. 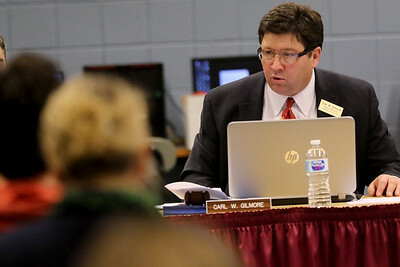 Matthew Apgar - mapgar@shawmedia.com Carl Gilmore addresses attendees during a District 200 Board of Education meeting at Woodstock High School on Tuesday, Feb. 27, 2018 in Woodstock. After hearing comments from members of the public, the board agreed to keep Dean Street School open. 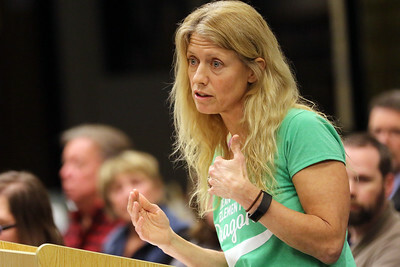 Matthew Apgar - mapgar@shawmedia.com Jessica Campbell, parent of a Dean Street School student, offers public comment in favor of keeping the school open despite recent discussions considering the school's closure during a District 200 Board of Education meeting at Woodstock High School on Tuesday, Feb. 27, 2018 in Woodstock. After hearing comments from members of the public, the board agreed to keep Dean Street School open. 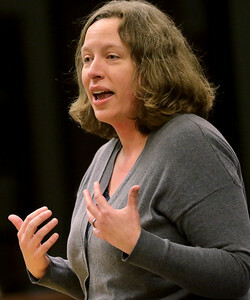 Matthew Apgar - mapgar@shawmedia.com Dean Street music teacher Carolyn Sharpe offers public comment in favor of keeping Dean Street School open during a District 200 Board of Education meeting at Woodstock High School on Tuesday, Feb. 27, 2018 in Woodstock. After hearing comments from members of the public, the board agreed to keep Dean Street School open. 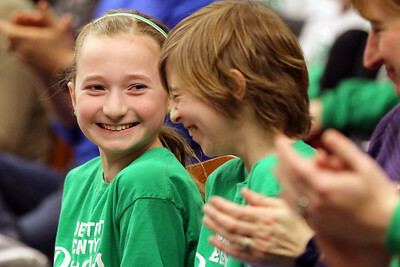 Dean Street fifth grade student Madeline Scaman, 10, smiles at her best friend and classmate, Annalise Wickersheim, 11, after giving public comment in favor of keeping the school open despite recent discussions considering the school's closure during a District 200 Board of Education meeting at Woodstock High School on Tuesday, Feb. 27, 2018 in Woodstock. 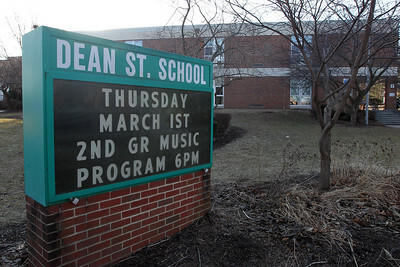 After hearing comments from members of the public, the board agreed to keep Dean Street School open.